This morning my friend showed me the website of an incredibly talented artist named Joy Kampia O'Shell. She crochets clothes designed to look like food. 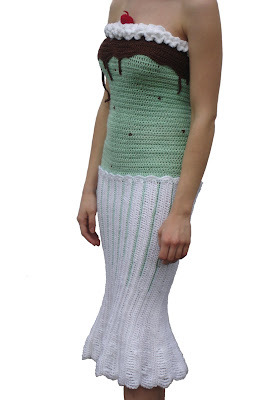 Actually, she can crochet anything, as her site reveals, but what really caught my eye were the dresses. I want one! 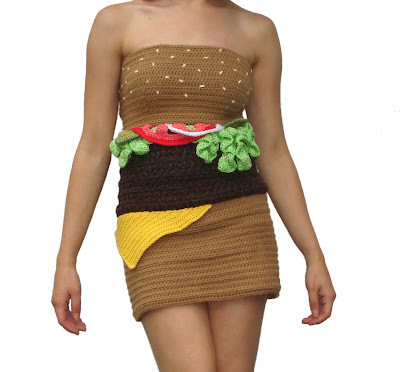 But that sundae dress is $900. I can see why, too. It's one-of-a-kind, gorgeous, and probably took forever to crochet. Oh and men, don't even bother trying to lick the whipped cream off. I love that! Man, how do people come up with this stuff? Oh man, I LOVE the donut necklace! I'm sure it's beyond my budget these days. Real donuts are probably cheaper, but not nearly so cute. Eve - that is a great idea! and there should be a movie about it. AJ - whoa! those are very cool. look at that sunny side up dress. love it.